When you run your boat as much as I do you’ll find it just as important not only to know how to fish but to be able to get to the fish. What’s the use of having a state of the art fishing machine with all the bells and whistles if the bells are mute and the whistle is dry? Probably just about as good as having a $500 rod and reel with no line on it. One thing I’ve learned over the years is boats don’t like to sit…so if you are one of those people who park your machine and come back 6 months later thinking “I think I’ll run 50 miles offshore tomorrow”… better make sure your seatow policy is up to date. One of the keys to boat maintenance is also one of the simplest- wash your boat regularly. Not only does routine cleaning facilitate a more pleasant and organized environment, but it also goes a long way towards counteracting the long-term effects of environmental wear and tear. Routine washing and waxing protect your boat from the elements. I use a product called woody’s wax. It’s a bit slippery so be careful when you first apply it on your decks. There are a myriad of finer points to keep in mind when it comes to boat maintenance. The best way to ensure that you have all the bases covered is to follow a checklist. Now it doesn’t have to be some huge 4 page list of items. Just a memory jog or something to remember to do if you’re gonna be away for a few months. One of the most common ways a boat can start to show scratches and damage is not only from when it’s in use- but from when it’s being docked. Make sure lines are securely fastened in place, neatly coiled, and do not show signs of breakage or wear. Depending on the type of battery your boat uses, check to ensure that it is properly charged also that it has the correct fluid levels. (distilled water) also be sure to keep your battery clean, as dampness corrosion and dirt can also drain your battery or prevent contact of your onboard charging system. Proper boat maintenance means being actively involved in, and attuned to, all aspects of your vessel. This means keeping an eye out for everything from loose fittings to fraying lines to any other areas of your boat that may need special attention or replacement. Many times, damages incurred to a boat could easily have been prevented by fixing that small item before it grew into something larger. Today’s ethanol based fuel will wreck your fuel lines and plastic (nylon) engine parts. Fuel additives are great but if possible try to use non ethanol fuel especially if it may sit for any extended period of time. Things like phase separation of the fuel sitting in your carb are bad news. If you’ve never seen what it looks like after sitting for a season… well just hope you don’t have to. Just the same, there’s nothing worse than having a bunch of dirt in your engine. Dirt dobbers love to build their houses in protected areas. Boat cowling make great homes for them and guess what they make their nest out of… dirt! A well placed nest in your air intake and boom, dirt in your engine! Rats and mice are no different when it comes to living aboard your boat. It’s like a cruise ship to them. There is tons of room for activities and who wouldn’t enjoy plenty of bunk beds for the kids. We had an old center console Boston whaler and a family of mice got in the console and set up basecamp. Why they like to chew on the wires is beyond me … but they chewed the covers off of the GPS antenna wire and some of the other power wires as well. That’s dangerous because now you have exposed wires which could lead to shorting out and could cause a fire. Another crucial and probably the most important aspect of boat maintenance are ensuring that your bilge pumps are functioning properly. There’s nothing more that can cause the death of your floating dream that having it sink. In the event that you need to use your pump you’d feel better knowing you just installed that set of 1100 GPH pumps. Making an investment in a boat cover can help keep your boat clean and free of a variety of contaminants that aren’t just related to dirt or water. Pine needles, falling leaves and bird droppings can also cause a lot of rot or damage if left unchecked. A boat cover can also prevent UV rays from breaking down rubber hoses or fading carpets and upholstery. Just make sure it has some ventilation to let the moisture out or you’ll have mold growing when you go to use it. But again these are just some food for thought items and not gospel by any means. Folks that’s gonna do it for me this week. So put out the gone fishin’ sign, stock up on tackle, load up that livewell and head on out to your favorite fishing hole…or better yet get out and find some new ones and catch’em up. Just remember to leave a few to make replacements for tomorrow. Tight lines and y’all stay safe!! For most of our anglers fishing fix we’ve been using whitebait and shrimp for plenty of trout and other inshore species. With these darker waters we’ve had over the past few months it can be difficult for the fish to visually locate food at distances more than a foot or so. That’s where the noise of the popping cork comes into play. Not only do fish feed by sight but also by smell, vibrations and more importantly… sounds of other feeding fish. With a popping cork, you provide almost all of the sense stimuli they normally use to feed. One of the most common mistakes I see on a regular basis with these noisy fish magnets is folks not leaving the bait in the same general area. How this is supposed to work is simple…Make a cast and with minimal movement to the bait, pop the cork with enough force to actually make a “pop” but not pull the bait off the hook. It should sound like a fish strike if you’ve done it correctly. Also this needs to be done without moving the whole rig more than a few inches from where you first made the original entry. Remember, you’re trying to call the fish to your bait and if you’re moving it 5 ft every time you pop that cork… well, you have defeated the purpose of the noise attractant. As far as rigging, I like to make my leaders (fluorocarbon) length close to but not on the bottom or in the grass. You want your bait to be easily seen when the noise draws them in for a closer investigation, not tangled up or able to hide in the weeds. Trying to fish mid column would be a more accurate description. Finish those popper corks with a split shot weight in the middle of the leader, a 4/0 to 6/0 circle hook and a live bait. Look for current rips at creek mouths, pot holes, grass flats and channels along mangroves. 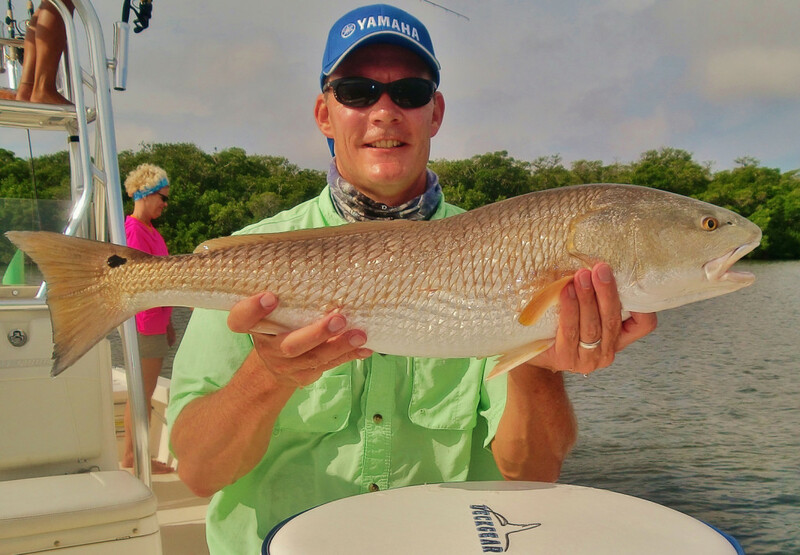 For the rest of our inshore news… still getting reports of quality redfish caught in places like the west wall and on up into Lemon and Sarasota Bay. Fish around structure like docks and up around the mangroves. Redfish will frequent our flats, bays and creek mouths in their quest for food. Look for them to be tailing in pods exceeding 30 fish. If you are finding them finicky… as they sometimes can be, a large live shrimp or chunked ladyfish still remain favorite “go to” baits. You might try Mirro-lure’s scented 3-3/4″ lil’ john soft plastic twitch bait, as it’s been the go to bait as we’ve fished these dark waters… rigged with 1/8th oz jig heads and the wind howling, still we were able to make very respectable casts. You can really sling that sucker without fear of it sliding off the jig head. Pending on the water clarity you’re fishing, colors like new penny, root beer and pink silver seem to be the ticket. Don’t forget to take a peek out on the beaches. Bonita, Spanish mackerel, and king mackerel are migrating in big numbers and offer a great opportunity to bend a rod. Nearshore is the easiest way to find fish right now…just look for the birds. We’re still seeing tons of birds working mixed bags of big ol’ spanish and king mackerel, jacks and bonito from just outside of the passes… on out to about 3 miles. Remember to keep a stout outfit rigged and “at the ready” …you never know when that bruiser cobia will stop by to see what all the commotion is about. I’ll keep one of my Penn Spinfisher V 6500 on stand-by with a 7/0 circle hook with 50 lb leader just for this reason. More times than not they will absolutely knock the snot out of a piece of cut bait or a jig tipped with a hunk of squid. If you’re ready to get out and see how we do it you can call us at 941-698-0323. You can also find Capt Kelly and I on Facebook, Instagram or our web page www.FloridaInshoreXtream.com. Well folks, you know the deal…gotta get on out and get my FIX on! So … tight lines and y’all stay safe!! Boca Grande tarpon fishing charters – Book Now! Copyright © Florida Inshore Xtream fishing charters. All rights reserved.